On Sunday, we hopped on the train and headed for the Railway Museum in Saitama. I really didn't expect much from this place - it was just somewhere to go that was near where we stayed. But boy, was I impressed. I don't even really care for trains, but I think I could have stayed there for a whole day learning, experiencing and playing. 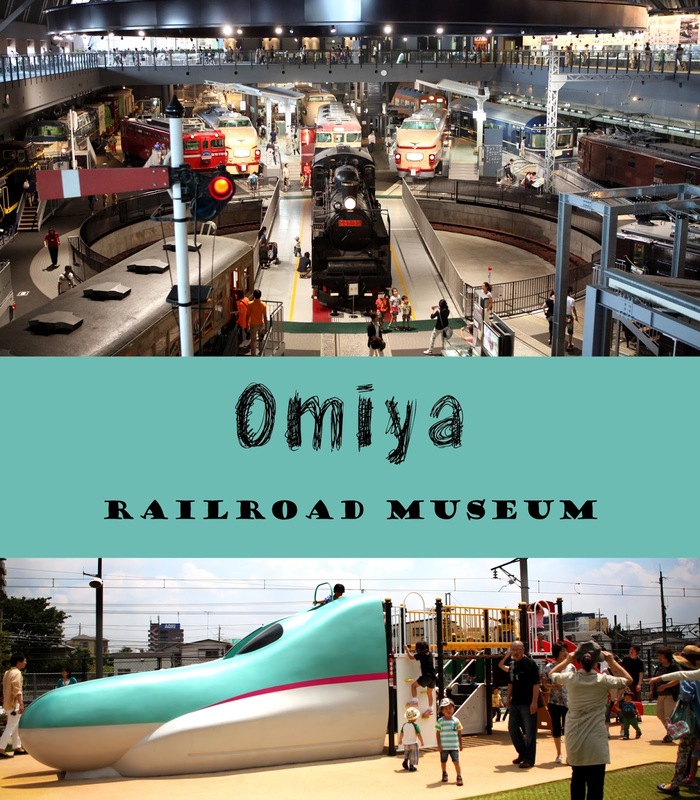 If you have any amount of interest in trains, the Railway Museum is definitely a must. It's pretty close from Tokyo, and it's worth every penny...err...yen. The view from the second story. Isn't it just magnificent? You were able to walk around, inside, and UNDER the trains. The museum catered to both kids and adults. The outdoor play area had a set of tracks with a small model of one of the newer bullet trains. And they had the most amazing play structure. I think one of the most amazing features was the diorama. The diorama featured some of the most popular trains and provided us with a sample of a day through the lens of the railroad. My son AND husband could have probably spent the whole day staring at this. Oh, and I can't forget the lunch. If you didn't know, you'll soon find out that we are all about eating. Plus, I think Japan is one of the places that does an awesome job incorporating the theme into their food. Blee and his bullet train bento, and his bullet train water bottle. Totally cool, right? Another thing about this place is that it is located between two train lines - regular and shinkansen (bullet). So, we were able to look out the window and watch the train fly by while we ate. If you come early enough, you can also get a timed entry ticket to OPERATE YOUR OWN MINI TRAIN. On train tracks. We got there about an hour after it opened, so we didn't have the opportunity to experience it, but it looked totally cool. You can read more reviews here and here.